Contact me for more information about our programs and services at Stacy@LivingUpp.com. Join the Lifestyle Design Studio. Book a training for your team or organization. Invite Stacy to write an article for your blog or publication. Invite Stacy to be a guest on your podcast or show. Buy a copy of The Self-Care Planner or leave a review here. Download The Self-Care Starter Kit. 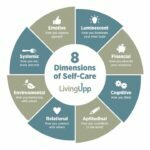 Sign up to receive weekly warm-upps about self-care and lifestyle redesign. Take the 8-Day Living Upp Self-Care Challenge.